If you are following The Perfect Health Diet, you will be eating about a pound of safe starches a day, and along with potatoes and sweet potatoes, white rice is one of the starches that are recommended. 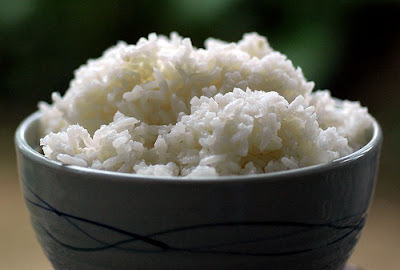 Anyone following The Perfect Health Diet would do well to cook a pot full of rice once a week. It's a great staple for any meal, and very simple to make. Cooked rice will keep in a closed container for up to a week in the fridge and longer in the freezer. The secret to great rice is very simple - Use twice as much water as you do rice. To make basic rice, put the rice and water into a pot with a pinch of salt. 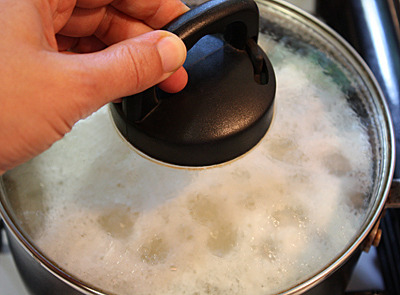 Bring the water to a boil, then cover, lower the heat to simmer and leave for exactly 20 minutes. 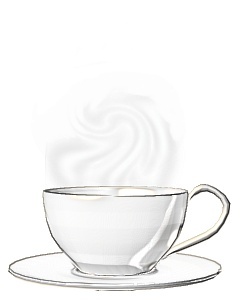 DO NOT REMOVE THE LID DURING THIS TIME. 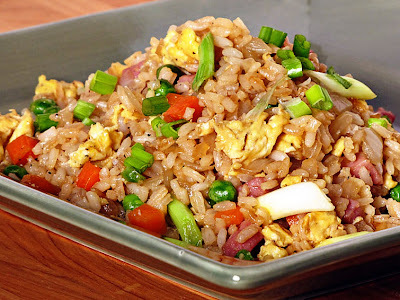 The rice needs the steam that is created to cook, and checking it before it's finished is the main mistake most people make when cooking rice. When deciding how much rice to cook, you can figure on ending up with approximately the amount of the water and rice combined. 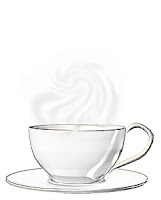 For example, a cup of rice and two cups of water will give you approximately 3 cups of cooked rice. As well as plain rice, you can also cook flavoured rice in exactly the same way just by varying the liquid you use and adding herbs, spices and vegetables. 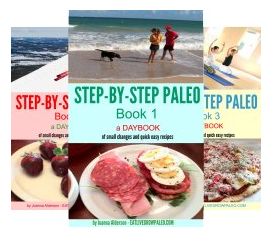 Here are some other versions to try with your meals. 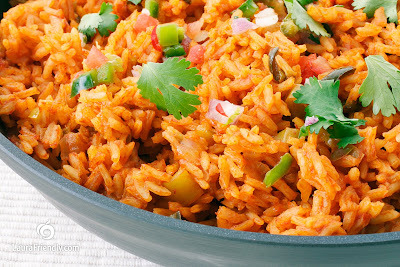 To this basic rice you can also add saute vegetables such as onion and peas once the rice is cooked. Or make a sweet version by adding a few raisins and sliced almonds. 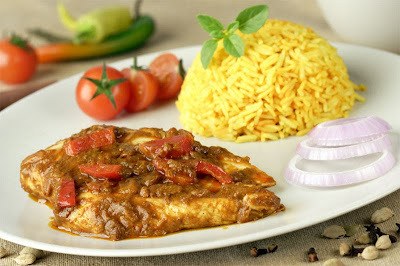 Cook the rice in the water and tomatoes or the tomato juice with added chilli powder. Saute the chopped green pepper and onion in a little olive oil and mix into the cooked rice. If using olives, mix these in after cooking. This isn't real risotto and won't have the same creamy texture, but it's a very good quick tasty alternative. 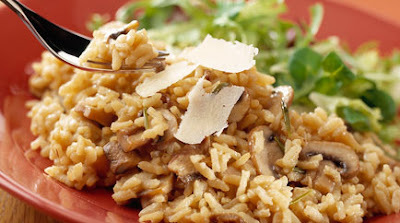 Cook the rice in the chicken stock with the seasoning and dried mushrooms. Mix the peas into the cooked rice, then cover and let stand for 5 minutes before serving. You can turn this into a complete meal by adding a cup of chopped protein - chicken, meat or seafood. You can also stir in 2 or 3 scrambled eggs with the vegetables for another alternative. 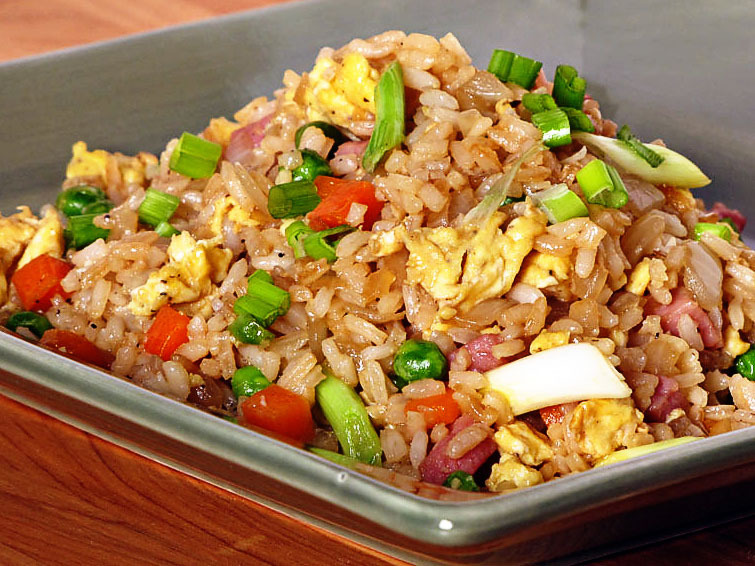 Cooked rice also makes a great cold weather breakfast. Since carbohydrates have been shown to help give a good night's sleep, having a bowl as an evening snack is a great idea as well, especially if you still need to make up that pound of starchy vegetables for the day. Combine all ingredients in a large pot and bring to a boil. Cover, turn the heat down to simmer, and leave to cook for 20 minutes. When rice is cooked, fluff with a fork to make sure the apple and spices are evenly distributed. Once cooked this can be kept in a closed container in your fridge for up to a week and longer in the freezer. To use, just put a serving into a bowl and microwave it on high for a minute. 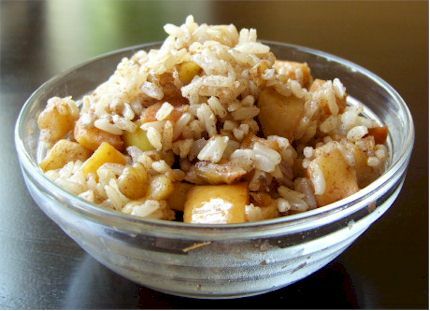 If you like larger pieces of apple in your rice, just add chopped apple instead of grated. 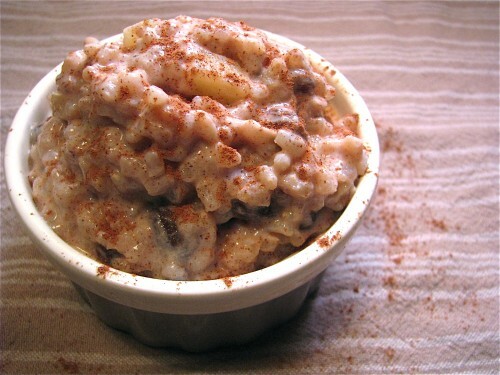 You can even add a few raisins or top with some chopped walnuts. If only I could eat rice... :( Sadly, of all grains, rice seems to affect me just as badly as wheat.